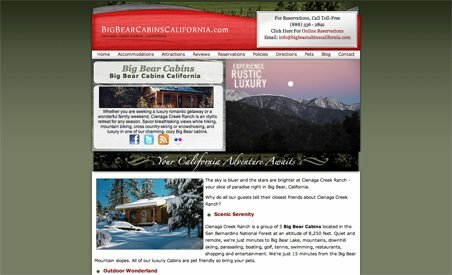 Cienaga Creek Ranch is Big Bear, California’s premiere accommodation. Located in the San Bernardino Forest, at an altitude of 8,250 feet, it’s a quiet, secluded getaway. Guests can choose from one of five cottages or else the newly built full-sized house, Juniper Ridge. Each cabin is loaded with luxuries: spacious kitchens, wood wainscoting, log trim and marble counters, showers and floors. Plus, Cienaga Creek is 100% pet friendly. Big Bear is famous for its outdoor activities, including skiing, hiking, fishing, mountain biking and horseback riding. With so much to do in the area, Cienaga Creek is a perfect retreat for any season.